If something in your life isn’t working, be willing to release it to God. your peace of mind and faith will allow you to trust that the Higher Power will take care of you. As you work toward Serenity and Inner Peace, your life’s unforeseen problems begin to lessen and disappear. 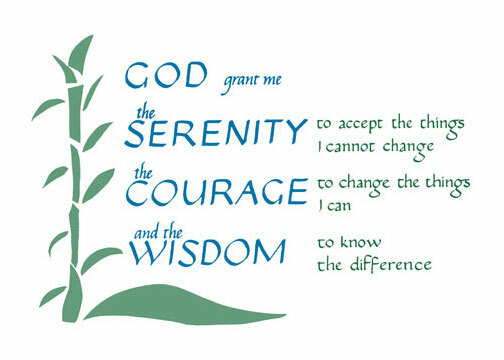 The Serenity Prayer is a prayer written by Reinhold Niebuhr on July 1, 1943. Early in World War II, the prayer was printed on cards and distributed to the troops by the U.S.O. However, the prayer is reported to have been used before that date in Twelve-step programs for those recovering from hurts, habits, addictions and hang-ups.